Tent camping has been the great adventure of this summer, which my children have been talking about since we reserved a spot 6 months ago. I grew up camping, and being out in nature, away from cell reception and wifi is really how I love to spend my time. 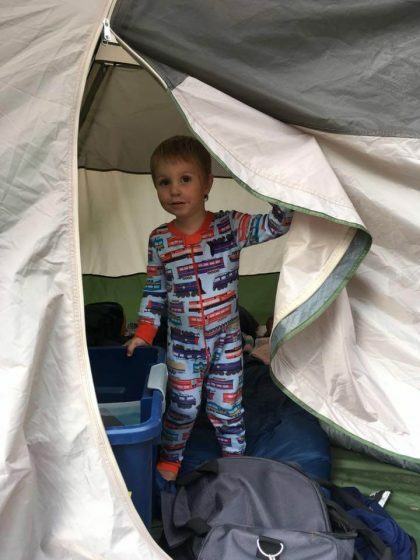 When camping with children, it’s time to check our expectations – camping, especially tent camping, is more of a ‘team building’ exercise than a relaxing one. But the payoff is SO worth it! We all love it, and come home exhausted, smelling like campfire, and with tons of much-loved memories. Growing up, if we had a camping trip planned we were *doing it* rain or shine. There were many a muddy, sloppy, and maybe somewhat miserable Memorial Day camping trips. Memories are made whether the weather is good or bad (looking back I have great memories of this!) but for this mama, I now know when to cut my losses, stop the struggle, and throw everything in the car. We camp close to home for this reason, and are lucky to live in an area where this is an option. Pre-kids, I was able to put up with an impressive amount of discomfort in a strong-willed desire to ‘stay out in the woods until I absolutely have to go back to work’. Bugs, rain, snow (! ), sleeping in the truck, forgetting coffee (! ), etc were all acceptable discomforts. This continued though having one baby… but once she got older and another arrived, I have turned into a fair-weather camper without regret. After a night of my baby sleeping fine, but me not sleeping at all because I was convinced my 3-month-old would freeze to death, I decided no more camping until my kids were bigger and we took a break from camping with nurslings. As I said above, the only difference between camping pre-kids and camping with my first was bringing clothes, diapers, and a baby carrier for her… but once more kids were added it was exponentially harder. So we took a break for a while, shattering my ego-driven ‘nothing will change when I have kids, I’ll figure it out’ and creating more realistic expectations. With kids, I choose populated camp sites so that I don’t have to carry bear spray as I make dinner, and there is help if I need a jump or something like that. We also like sites that have running water and are right up against a water source. With my kids in lifejackets if the water is deep and within sight, they can throw rocks into the lake, build a dam in the creek, dig in the dirt, and ‘adventure’. Water is essential for much of my children’s outdoor play, and if the camp site isn’t right up against water, it’s hard to prepare food and clean up without giving into pleading to go to a river/lake. If this happens, I find we blow through all our packaged food quickly, and really – tiny stomachs don’t do so well and camping burnout quickly ensues with daily meals of jerky, nuts, and water. If you’re camping near a creek or river and have young children, don’t go when the snow just melted and the river is rushing. A fast river is dangerous even for children that can swim, and it’s not worth the stress. If it’s bug season, try not to camp near stagnant water, or you’ll be eaten alive. A solar shower is hard to take a shower under (we like to think that swimming and ample use of deodorant keeps us fresh), but it’s perfect for having slightly warm water to wash hands before eating. Two tubs for washing, plus a wash cloth, scrubber, dish soap and 2-3 dishtowels is something the whole family can get involved with. Keeping camping meals simple is the best way to start unless elaborate camping is really your thing. Trying to cook an elaborate meal is a recipe for burnout when camping with young (hungry) children. See these videos below on camping meal prep and camping meals as I cook them. Instant coffee and a camp stove that can heat water quickly makes quick work of coffee. I’ve never been able to get the ‘camping percolators’ to do anything but gritty watery coffee-like liquid. Cold brew is a valid option as well, just pre-make ahead of time. Nothing fills my heart more than hot coffee, a beautiful lake in the morning light, and sleepy children emerging from a tent still smelling like campfire and excited for the day. Setting up a campfire (which may be damp from the night) in the morning is not my favorite and takes a surprisingly long time. Then the fire has to be extinguished before going on the day’s adventures. …more than cook, clean up, and then cook again. That’s just how camping food with kids works! Even if your meals are simple, the necessity to wash dishes after each meal and heat water on the stove and then wash in tubs draws out this process. Rather than wish you could get more done, this is a great time to put into practice what we learned in Chop Wood Carry Water and embrace the primal simplicity of this rhythm. Our typical day when camping has us waking up around 8 (this year my kids sleep well camping! ), breakfast gets started right away and is ready by 8:30, cleaned up by 9. Then we fish a little, or go out on the paddle board, or hang out whatever got wet the night before. Lunch usually has less cleanup involved but still takes about an hour start to finish. If it’s cold, we’ll fish again, or gather firewood and start a fire mid afternoon. If it’s warm, this is great swimming and paddle boarding time. We aim for our normal 5:30 dinner hour, and if we’re cooking over the fire we try to start the fire by 4:30 so it’s ready in time. Dinner is cleaned up by 6:00 and we sit around the campfire until 7. Then we start cleaning the site up to prepare for nighttime, and putting the kids who need to go to bed earlier to bed. Children will refuse to nap, have a hard time going to sleep, and be up with the sun. For this reason, we keep our camping trips short, and fairly close to home. We schedule our biggest ‘adventure’ for the second day when excitement can still propel little hikers, and more calm simple activities for days when everyone is more tired. Afternoon thunder storms can provide an exciting break in the tent with littles napping or older kids playing Uno. All-day rain with active toddlers is going to be hard. Even a beautiful sunny day the 4th day of camping with children who haven’t slept well the entire time is a recipe for meltdowns. It’s okay to leave early. Sometimes we reserve a campsite for one more night longer than we’re actually planning on staying just so we can be there the whole next day. Then we go home for an easy dinner, bath, and bed in our own beds rather than staying one more night. Recreational equipment, again, is something that I prefer to keep simple. Rather than half a dozen rafts and water play toys, I try to really focus on what my kids LOVE and play with again and again. This will look different for everyone. For a short trip I will bring one thing (sand toys, the paddle board, OR fishing equipment). Paddle board- we all share one. With 3 kids on there at the same time it’s a considerable amount of teamwork to go anywhere, and taking turns isn’t horrible either. Life jackets, even for swimmers, give peace of mind. Small children’s kayak – watching my three kids pile on and nearly sink (it’s unsinkable) the kayak provides hours of entertainment for us all. Extra small paddles don’t take up much room, but a $12 paddle is what the kids really want (control!) and they take up way less space and cost way less than an additional kayak or paddle board. A bucket and shovel for each kid – sturdy over novelty. Simple squirt guns (the kind that you put in the water, and then pull back to handle to fill) are popular and entertaining, especially among toddlers who first learn how to use them. Uno, Go Fish, or an age appropriate card game for afternoon thunder storms. Frisbee, football, ladder golf, or some kind of active game that is quiet and you do with friends you make at the campsite. Bikes are fun in campgrounds if you have room to bring them. Show the kids the loop they’re allowed to go on (most campgrounds are made of a few loops). The post Simple, Successful, and Fun Family Tent Camping appeared first on Health, Home, & Happiness.